Definition at line 54 of file imagelist.c. Definition at line 57 of file imagelist.c. Referenced by ImageList_Add(), ImageList_BeginDrag(), ImageList_Copy(), ImageList_DrawIndirect(), ImageList_Duplicate(), ImageList_GetIcon(), ImageList_GetImageCount(), ImageList_GetImageInfo(), ImageList_GetImageRect(), IMAGELIST_InternalExpandBitmaps(), ImageList_Merge(), ImageList_Read(), ImageList_Remove(), ImageList_ReplaceIcon(), ImageList_SetIconSize(), ImageList_SetImageCount(), ImageList_SetOverlayImage(), and ImageList_Write(). Definition at line 59 of file imagelist.c. Referenced by ImageList_Add(), ImageList_Create(), ImageList_Duplicate(), IMAGELIST_InternalExpandBitmaps(), ImageList_Remove(), and ImageList_Write(). Definition at line 77 of file imagelist.c. Referenced by ImageList_Create(), and ImageList_SetIconSize(). Definition at line 65 of file imagelist.c. Referenced by ImageList_Create(), ImageList_DrawIndirect(), ImageList_GetBkColor(), ImageList_ReplaceIcon(), ImageList_SetBkColor(), and ImageList_Write(). Definition at line 64 of file imagelist.c. Definition at line 58 of file imagelist.c. Referenced by ImageList_Add(), ImageList_Create(), IMAGELIST_InternalExpandBitmaps(), ImageList_Read(), ImageList_Remove(), ImageList_Replace(), ImageList_ReplaceIcon(), ImageList_SetIconSize(), ImageList_SetImageCount(), and ImageList_Write(). Definition at line 80 of file imagelist.c. Referenced by ImageList_Add(), ImageList_Create(), ImageList_CreateImage(), and ImageList_SetColorTable(). Definition at line 60 of file imagelist.c. Referenced by add_dib_bits(), ImageList_Add(), ImageList_BeginDrag(), ImageList_Copy(), imagelist_copy_images(), ImageList_Create(), ImageList_DragMove(), ImageList_DragShowNolock(), ImageList_DrawIndirect(), ImageList_Duplicate(), imagelist_get_bitmap_size(), ImageList_GetIcon(), ImageList_GetIconSize(), ImageList_GetImageInfo(), ImageList_GetImageRect(), ImageList_Merge(), imagelist_point_from_index(), ImageList_Read(), ImageList_Replace(), ImageList_ReplaceIcon(), ImageList_SetDragCursorImage(), ImageList_SetIconSize(), and ImageList_Write(). Definition at line 61 of file imagelist.c. Definition at line 63 of file imagelist.c. 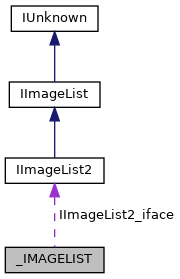 Referenced by ImageList_BeginDrag(), ImageList_Create(), ImageList_CreateImage(), ImageList_DrawIndirect(), ImageList_Duplicate(), ImageList_GetFlags(), IMAGELIST_InternalExpandBitmaps(), ImageList_Merge(), and ImageList_Write(). Definition at line 79 of file imagelist.c. Referenced by add_dib_bits(), add_with_alpha(), alpha_blend_image(), ImageList_Create(), ImageList_DrawIndirect(), ImageList_Duplicate(), IMAGELIST_InternalExpandBitmaps(), ImageList_Read(), ImageList_Remove(), ImageList_ReplaceIcon(), and ImageList_SetImageCount(). Definition at line 68 of file imagelist.c. Referenced by ImageList_Create(), ImageList_GetImageInfo(), IMAGELIST_InternalExpandBitmaps(), ImageList_Remove(), ImageList_SetIconSize(), ImageList_SetImageCount(), and ImageList_Write(). Definition at line 69 of file imagelist.c. Referenced by add_dib_bits(), alpha_blend_image(), ImageList_Add(), ImageList_Create(), ImageList_DrawIndirect(), ImageList_Duplicate(), ImageList_GetIcon(), ImageList_GetImageInfo(), IMAGELIST_InternalExpandBitmaps(), ImageList_Remove(), ImageList_Replace(), ImageList_ReplaceIcon(), ImageList_SetIconSize(), ImageList_SetImageCount(), and ImageList_Write(). Definition at line 75 of file imagelist.c. Referenced by ImageList_Create(), and ImageList_DrawIndirect(). Definition at line 76 of file imagelist.c. Definition at line 70 of file imagelist.c. Referenced by add_dib_bits(), alpha_blend_image(), ImageList_Add(), ImageList_BeginDrag(), ImageList_Copy(), ImageList_Create(), ImageList_CreateImage(), ImageList_DrawIndirect(), ImageList_Duplicate(), ImageList_GetIcon(), IMAGELIST_InternalExpandBitmaps(), ImageList_Merge(), ImageList_Read(), ImageList_Remove(), ImageList_Replace(), ImageList_ReplaceIcon(), ImageList_SetColorTable(), ImageList_SetIconSize(), and ImageList_SetImageCount(). Definition at line 71 of file imagelist.c. Referenced by add_dib_bits(), alpha_blend_image(), ImageList_Add(), ImageList_BeginDrag(), ImageList_Copy(), ImageList_Create(), ImageList_DrawIndirect(), ImageList_Duplicate(), ImageList_GetIcon(), IMAGELIST_InternalExpandBitmaps(), ImageList_Merge(), ImageList_Read(), ImageList_Remove(), ImageList_Replace(), ImageList_ReplaceIcon(), ImageList_SetIconSize(), and ImageList_SetImageCount(). Definition at line 56 of file imagelist.c. Referenced by ImageListImpl_QueryInterface(), and is_valid(). Definition at line 72 of file imagelist.c. Referenced by ImageList_Create(), ImageList_DrawIndirect(), ImageList_Remove(), ImageList_SetIconSize(), ImageList_SetOverlayImage(), and ImageList_Write(). Definition at line 82 of file imagelist.c. Definition at line 78 of file imagelist.c. Referenced by ImageList_Add(), ImageList_Copy(), ImageList_Create(), and ImageList_CreateImage(). Definition at line 62 of file imagelist.c.